Posted: Fri Sep 21, 2018 6:51 pm Post subject: 1979/80 ST80? 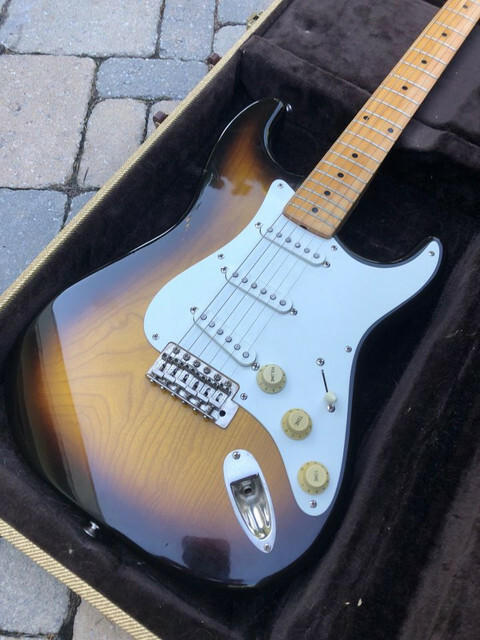 Hi guys, curious about your guys' opinion on this guitar. 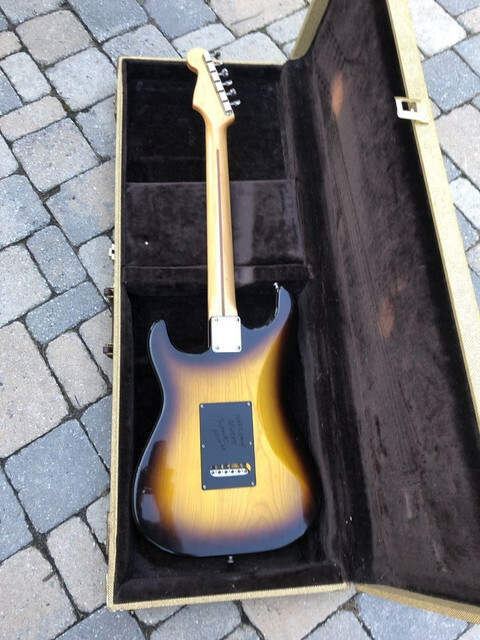 In the description the seller lists it as a 1979/80 and says he believes it is an ST80. I'm not very close to it so I can't look at it in person, all I've got are these pics for now. Curious if you guys think it is an 80 or not. It looks legit but I'm no expert, that's why I came here! 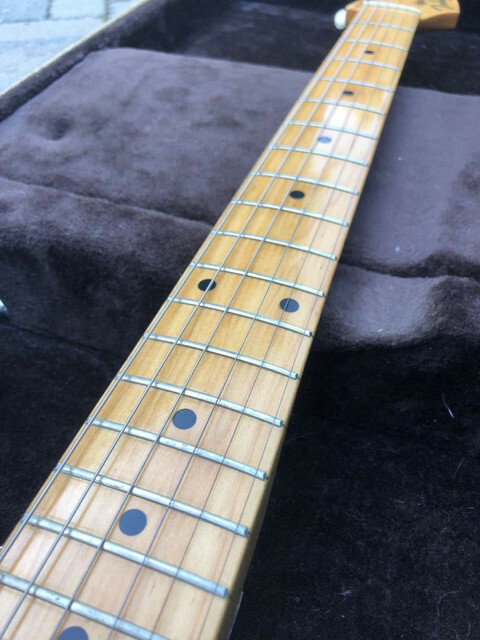 It's hard to tell from the pics but it almost looks like there is no model number stamped in the end of the fretboard? Is that a sign of year or anything? Or is that a red flag at all? I've asked about the serial number but he hasn't gotten back to me yet. It looks to be a 1 piece body, not sure if lower models ever came with 1 piece bodies? 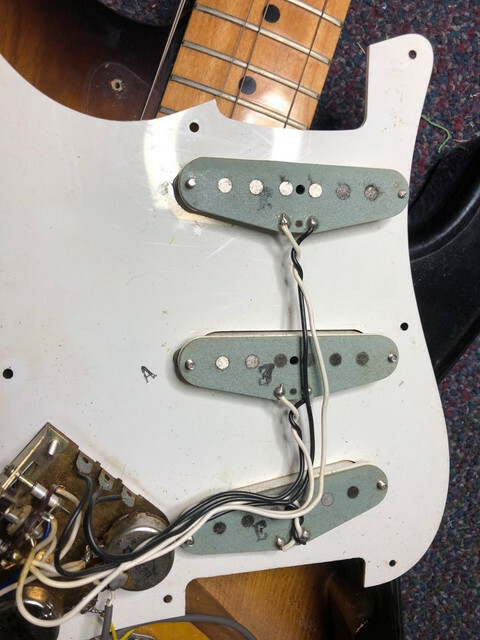 Wiring looks original with E stamped pickups. He says it has a big soft V neck as well. I'm not 100% because i'm not up on the old springy's but "A" on the back of pickguard usually denotes a higher model along with "E" pups. 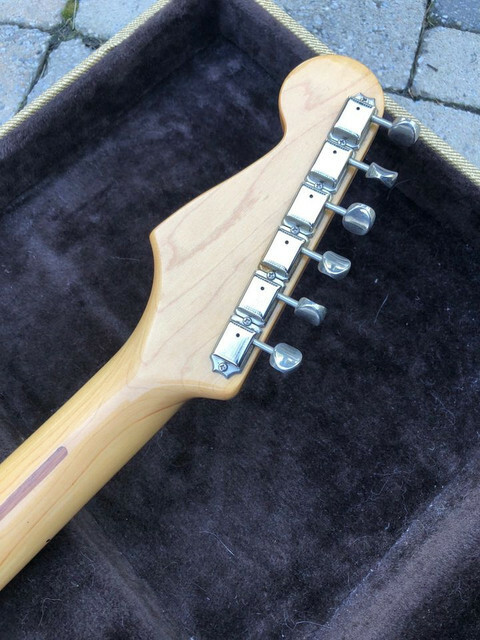 Hard to take a picture of a soft V neck but everything else points to this guitar being an 80 or higher. Might not be 79 because it think they were still stamping last fret. Could be late '80-81 tho. Hopefully somebody with more Springy expertise will come along soon. Thanks for the reply. I didn't know about the A stamp on the pickguard. It's looking like it is a proper 80. 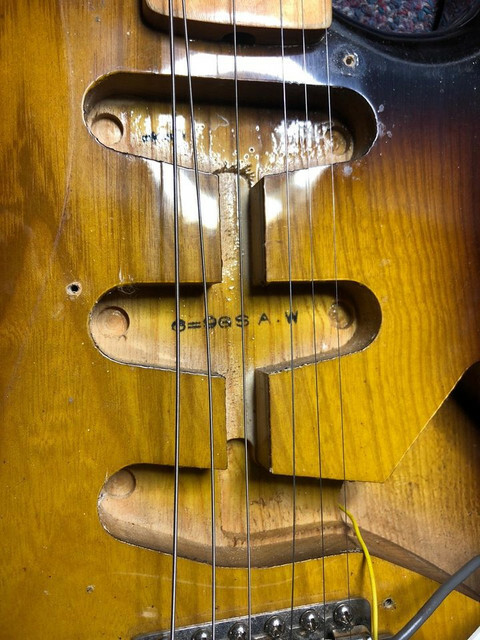 As for the neck profile, the seller can always take some soft solder or wire and and form it to underside of the neck at say the 3rd and 10th frets to show the profile. Nice guitar. If it's nitro finished, its an 80 or > . I have a 1980 ST-100 Same color as that one. The 100 has the gold hardware and is 1 piece. From what I remember the 80 was 2 piece body and both 80 and 100 were nitro. With the exception of the 1982 3rd quarter being 2 piece body for the 100. Then at that time the 80 went to a 3 piece body though I cannot remember for sure. Anyways, correct me if I am wrong but that guitar looks like a 1 piece body. I also have a st-65 from 1981 Though that one is a solid color. I think that guitar is split right down the middle like the 80 is. Then the 50 and below being 3 piece split on the edges and poly. If it was a stock 100 it would have gold hardware. Maybe it is a custom order 80 with a 1 piece body. I cannot remember if they ever had the 80 as a 1 piece stock but I do not think so. If that is a 2 piece body it is a good looking one. If in fact it is a 1 piece body, looks like it is a special order ST80 due to not having the gold hardware of the 100. 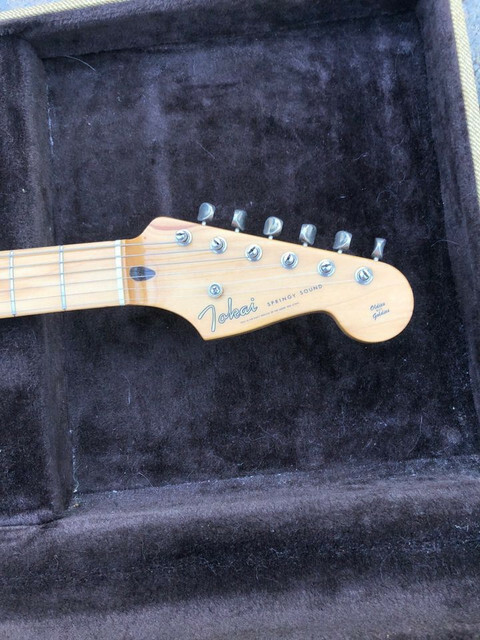 I'm still curious about the model number stamped on the fretboard. I'm unsure if it is there or not on this one, but is there specific years that had it vs not? Sounds like according to brokentoes that they did it in '79 but maybe sometime in late '80 they stopped? Just curious about that more than anything. Either way I think I'm going to pull the trigger, it looks like a nice one and the price is right, plus it comes with the tweed case! They had the stamp until 1980 they got rid of it in 1981. If it is a one piece body it is a 1981 or 1982 since it does not have the stamp on it. They made the st-100 1 piece until 2nd quarter 1982 then it switched to 2 piece. The st-120 (same thing as the st-100 but with a price increase) was made 1 piece until the end of 1982. From what I know that was the end of the 1 piece everything after that was 2 piece from what I know. Yours looks 1 piece sen ash to me. I know there are other (okay, at least one other ) 'one piece' ST80(s) around. I thought I had heard about a few 80's being 1 pieces before. I did hear about st-80 and some being one piece. I remember looking into that when I purchased my St-100. But I hear they are very rare. From what I remember they were early on. Late 70's until I do not know 1980 maybe. I really do not remember 100%. I just remember looking and the st-100 was not much more than the 80 so I got a 100 instead to make sure I got a 1 piece. The info I found about the 1 piece 80 was very limited. So, I gave up searching for it. 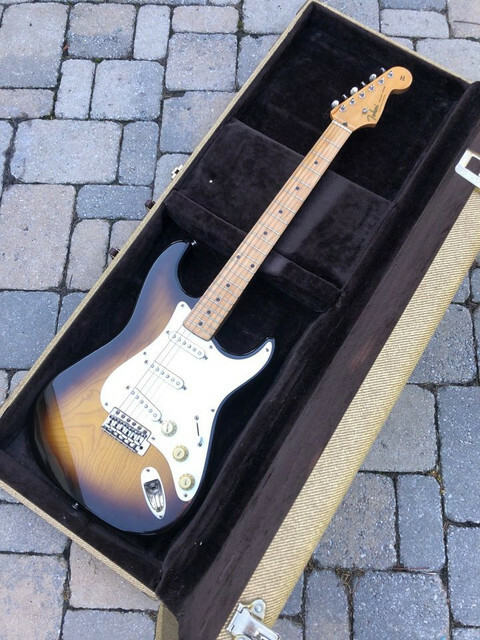 Either way the Strat #44 posted looks great I would get it either way if it is a good deal. I'll be very surprised if it actually is a 1 piece and not just a very well matched 2 piece. I feel I'm getting a good deal as is, but if it is a 1 piece it's even that much more of a deal. He said it's been in his storage for years so I'm sure he's doing well on the sale anyway. I'm thinking the same, very nice. @#44 let us know when you get it if it is a 1 or 2 piece. Will do. Hopefully get it middle of next week.